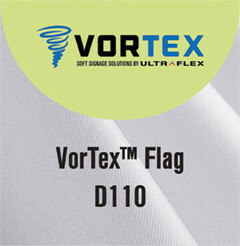 VorTex Flag D110 is a knitted flag fabric treated specifically for direct dye-sublimation, latex, dye-sublimation transfer and UV printing. Excellent bleed through and wind flow characteristics. Ideal for flag displays and temporary outdoor banners.